Geotube dewatering tubes, sometimes known as geobags, are used for sludge dewatering projects of all sizes and there is good reason - simplicity and low cost. There are no belts, gears, or complicated mechanics. Geotube containers use an engineered textile that is designed for dewatering of high moisture content sludge and sediment. They are available in many sizes, depending on your volume and space requirements. Geotube systems can even be mounted in mobile roll-off containers that can be transported around your property as necessary. It's one of the most versatile dewatering technologies available. And one of the most effective. Standard tube sizes are available but they can be manufactured to suit project requirements. Geotube dewatering containers are supplied to site and placed into position. Sludge which is treated with specialist polymers is then pumped into the containers and the clear effluent water is then drained leaving the solid remains within the container. When full the containers can be disposed at a landfill or the solids removed and land-applied. This simple but effective process makes Geotube dewatering containers ideal for the pulp and paper industries for primary and secondary lagoon cleanout and for mining processes to remove tailings, coal sludge and other minerals. Geotube dewatering containers have also been used for water and wastewater treatment dewatering to provide a reduction of up to 85% to 90% in BOD and in agriculture to efficiently manage waste in the dairy, poultry and other agricultural industries. Sludge (dredged material) is pumped into the Geotube container. Environmentally-safe polymers are added to the sludge, which makes the solids bind together and water separate. The Geotube container's unique fabric confines the fine grains of the material. Clear effluent water simply drains from the Geotube container through the small pores in the specially engineered textile. This results in effective dewatering and efficient volume reduction of the contained materials. And this volume reduction allows for the repeated filling of the Geotube container. Over 99% of solids are captured, and clear filtrate can be collected and recirculated through the system. 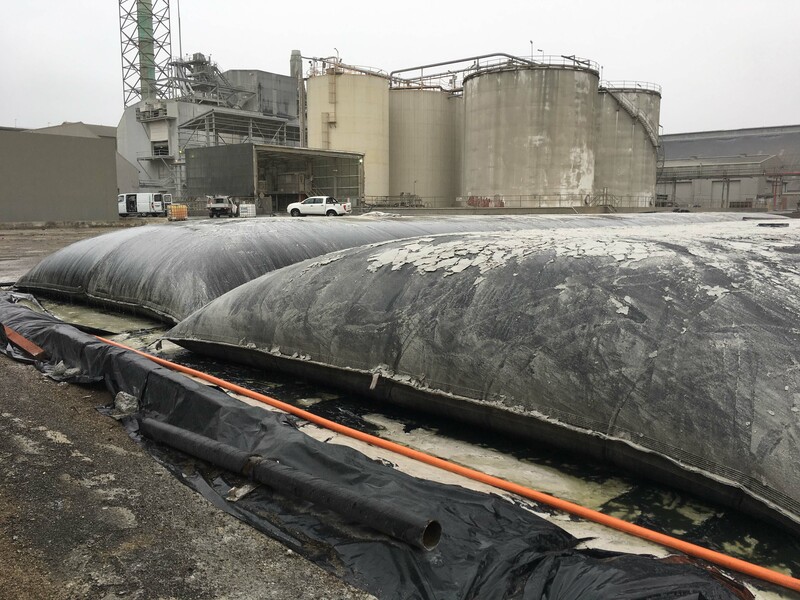 After the final cycle of filling and dewatering, the solids remain in the bag and continue to densify due to desiccation as residual water vapor escapes through the fabric. Volume reduction can be as high as 90%. When full, the Geotube container and contents can be deposited at a landfill, remain on-site, or the solids can be removed and land-applied when appropriate.